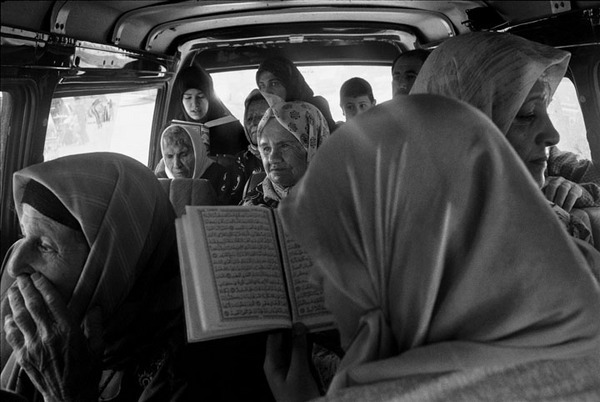 Evacuees from Aitaroun, in southern Lebanon, sit in a van - some reading the Quran - outside what became an emergency shelter at the hospital in nearby Tebnine. Tebnine became a transitional village for those fleeing the southern villages making their way north to Tyre and Beirut. Just meters from the hospital entrance, unexploded cluster bombs remained a danger for those arriving at the hospital. Farah Nosh, "Lebanon," in POYi Archive, Item #46182, http://archive.poy.org/items/show/46182 (accessed April 18, 2019).